Australians love being outdoors in the summertime. The Melbourne summer for 2012/2013 is well on its way, showcased by our recent sunny days of 27 degrees Celsius. With the coming of summer and its accompanying levels of bright glaring light, we need to consider various options to protect our eyes throughout the festive season. 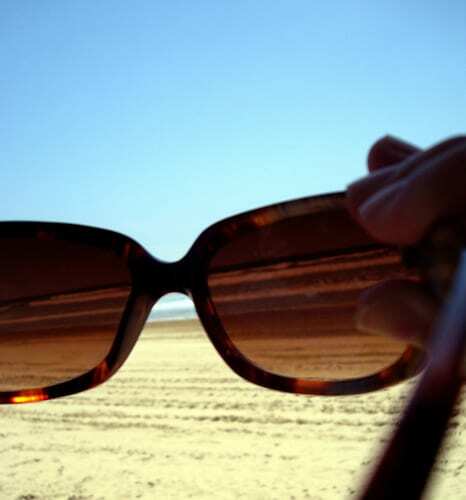 Here’s an experienced optometrist’s perspective on how to tackle the high UV glare that Melbournians often have to deal with. 1. Sunglasses: The first rule is quite simple – make sure you have one pair of good quality sunglasses. There are different levels of lens quality, and there are both polarised and non-polarised lens types. Polarised lenses are the best. Normal tinted lenses cut out both bad glare and good (useful) light, while polarised sunglasses selectively cut out the glare without affecting your vision. Check out these Serengeti Verucchio sunglasses. These are great polarised lenses. Under very strong light, tinted lenses are fine, but not the optimum solution. However, under dim and low light conditions they can actually become hazardous. For example, suddenly driving into an underground car park – everything becomes too dark. So, have good polarised sunglasses. 2. Lens quality: You can get cheap sunglasses, or optical quality sunglasses. The key is to have sunglasses lenses that do not distort the light. Very cheap lenses have so much light distortion they can actually give users a headache. Make sure you get good quality lenses. 3. Lens coating: Ensure your sunglasses lenses have a high quality lens coating. This means a scratch-resistant UV coating. Scratches on your lenses cause glare because they increase the amount of distorted light going into your eyes. High quality lens coatings guarantee there are never any scratches. 4. Prescription sunglasses: People who already have prescription glasses can purchase prescription sunglasses. Be aware that if you decide to take this route there are limitations on the number of different sunglasses frames you will be able to choose from. If you aren’t able to find a pair of prescription sunglasses that suits your facial structure, budget, or personal fashion style, your next option to consider is wearing contact lenses behind your normal sunglasses. People who fit into the latter category should come down and see an optometrist at Visual Q Eyecare to get properly fitted for contact lenses. 5. Contact lenses: During the Melbourne summer, Australians love playing sports, and in particular, water sports. Please know that you should never wear your glasses into the water. Your frames can rust, and the lens coating will be ruined. Add salt or chlorinated water into the mix and it’s even worse. If you’d like to be able to see under water, contact lenses are your best option. Still, we recommend wearing goggles over your contact lenses, as they protect your eyes from irritation caused by salt or chlorine. If the contact lenses have been fitted properly by an experienced optometrist, you shouldn’t have to worry about them falling out while swimming. 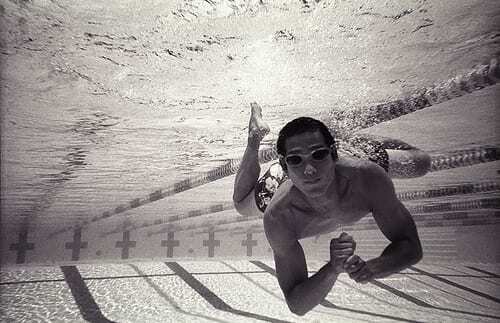 When wearing contact lenses, your best bet is to wear them behind swimming goggles. ‘Dailies’ are the most suitable type of contact lens for water sports, but if you choose to wear extended or continuous wear contact lens types you’ll need to wear goggles, and after being used in the water make certain that they’ve been thoroughly disinfected. 6. Eye drops: In summertime there is an increase in the potential for dry eyes, especially for those people who wear contact lenses. People should be wary of dry eyes, including those who wear glasses, and carry eye drops at all times. If your eyes consistently go red, then you should come in and see us for a check-up. It could actually be a problem with the oil glands in your eyes, and the eye drops alone won’t solve the issue. 7. Transitional lenses: For people who wear prescription glasses, but who don’t own prescription sunglasses, consider wearing transitional or photo-chromatic lenses. These lenses become dark when you go outdoors directly under the sun. 8. Reading on the beach: Aussies love reading a good book while sitting on the beach at St. Kilda, Sandringham, Mornington Peninsula, or along the Great Ocean Road. Did you know you could get customised prescription reading glasses? Sunglasses lenses are usually made for driving and looking in the distance, but these sunglasses are designed for looking at objects close at hand. You can get either tinted or polarised (preferred) versions. You gotta wear sunglasses when reading on the beach! 9. Coloured contact lenses: Come the festive season; please refrain from going out and purchasing any old pair of coloured contact lenses just for the fun of it. Firstly, if they are not from an optical outlet their quality cannot be assured. Secondly, your eyes could be damaged from wearing an inappropriately sized contact lens. 10. When a contact lens becomes stuck in your eye: If a contact lens ever gets stuck in your eye, do not remove it by force! This could result in tearing the front layer of your cornea. When such an event does happen, put a lot of eye drops into the eye and then go see an optometrist. Use eye drops like Artificial Tears, not antihistamine-based eye drops used for red eyes. We at Visual Q Eyecare hope that these top ten summer eye care tips are of help to you during Melbourne’s often blazing summer heat. Please feel free to contact Visual Q Eyecare for an appointment with an optometrist, or come down to our shop in South Yarra to see our wide range of polarised and tinted sunglasses. Thanks to Jesslee Cuizon, R_x renee barron, and radarxlove for the images.